Lahnstein has two railway stations: Niederlahnstein and Oberlahnstein. Both are connected to the German railway network. You can walk to the Ruppertsklamm (about 40 minutes) or take a cab. Take the federal highway B 260 from Koblenz to Bad Ems. After a few hundred meters, you can see the entrance to the Ruppertsklamm on the left side. Parking facilities are available. Lahnstein is a stop of various shipping lines. Landing places are 'Oberlahnstein' or 'Niederlahnstein'. The Ruppertsklamm near Lahnstein is one of the highlights of the Rheinsteig (a 320 km trail on the right side of the Rhine). The gorge belongs to the nature reserve Nassau and is an adventure for young and old. The Ruppertsklamm is easily accessible via the B 260. One enters the gorge through the wooden entrance gate. The forested gorge is only 1,5 km long, but these kilometers are extremely varied and exciting. A little brook has carved the gorge deep in the shale and sandstone. There are little bridges, steps in the rocks and stretched wire ropes for a secure hold. After raining, can one easily slip (good shoes are a must!!). Take a hike along the Ruppertsklamm and with a little luck you will see a fire salamander, woodpecker or a stag beetle. In the middle of the gorge, you will find a plaque commemorating Theodor Zais. Between 1910 and 1912, he has opened the gorge, and made accessible. The refuge 'Ruppertsklamm' (unfortunately unwardened) is waiting for you at the end of the path, but it offers good BBQ. It's worth packing a few sausages. The hike trough the Ruppertsklamm is an exciting mixture between hiking and adventure and belongs to one of the most beautiful treasures in Rhineland-Palatinate. Have fun! Visit the nearby Koblenz (Coblenz) where the Deutsches Eck (German Corner) and the Festung Ehrenbreitstein (Ehrenbreitstein Fortress) are situated. The view from Festung Ehrenbreitstein at Koblenz is fantastic. Today it's a youth hostel, restaurant and a museum. Tip: A cable car ride over the Rhine. The Ruppertsklamm is located in the wine region Mittelrhein (Middle Rhine). 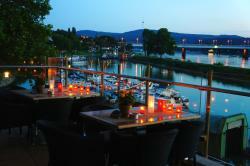 What could be nicer than to sit on the banks of the Rhine or Lahn with a glass of wine and a good meal? The most common wine grown here is Riesling, the "King of White Wines" (König der Weißweine). The biggest 'Rhein in Flammen' (Rhine in Flames) event takes place in Koblenz every year, on the second Saturday in August. Firework and brightly illuminated ships attract hundreds of thousands of visitors every year. This 4-star hotel lies in a park outside Koblenz, in the Upper Middle Rhine Valley. It offers wellness facilities, free Wi-Fi and views of the Rhine and Lahn valleys. The quiet rooms of the Wyndham Garden Lahnstein Koblenz include a TV and a safe. This 4-star hotel in Koblenz stands beside the Rhein-Mosel-Halle convention centre and the Kurfürstliches Schloss castle, on the River Rhine. It offers a 24-hour gym with sauna, a riverside terrace, and underground parking. Offering a riverside terrace and spa with indoor pool, this family-run, 4-star hotel in Koblenz enjoys great views of the UNESCO-listed Upper Rhine Valley with its famous Deutsches Eck Confluence.